Kombucha is composed by fermenting tea with the help of a relatively “mushroom”-looking symbiotic culture of multiple yeasts and healthy bacteria. The slightly acidic Kombucha was known in Russia as from the 19th century, and has been surrounded by claims about its many health-bringing qualities ever since. Some also claim that the beverage has ancient Chinese and/or Japanese origins, often invoking links to Ancient Oriental health benefits of sometimes dizzying magnitude. Regardless of its history and possible health benefits, Kombucha remains a very nice, refreshing drink. Due to its slight acidity, it is perhaps somewhat more likely to appeal to adults than to children. 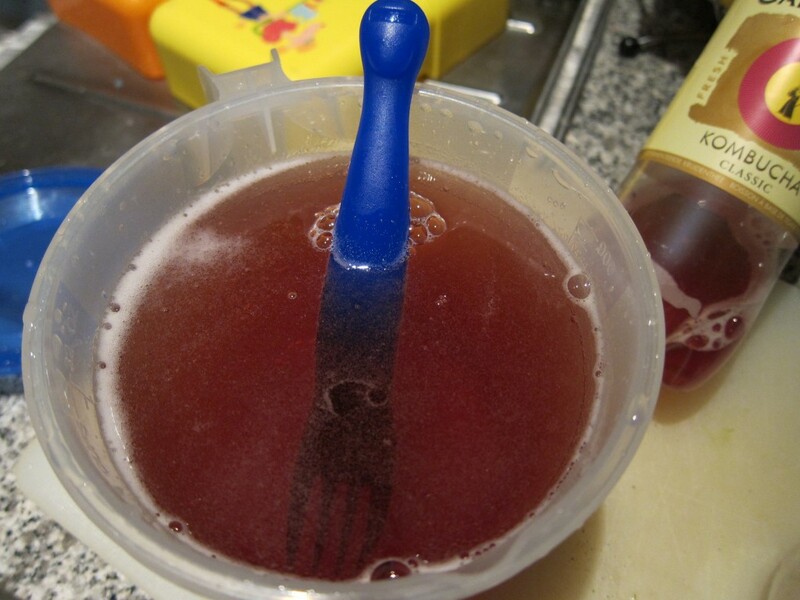 Myself, being very fond of Kombucha as a drink, I began to ponder what it would be like to make a Kombucha sorbet. To prepare the sorbet, I started by making a sugar syrup. Always in a hurry, I went with the simple Bartender-method of shaking equal amounts of sugar and water until all the sugar had dissolved. 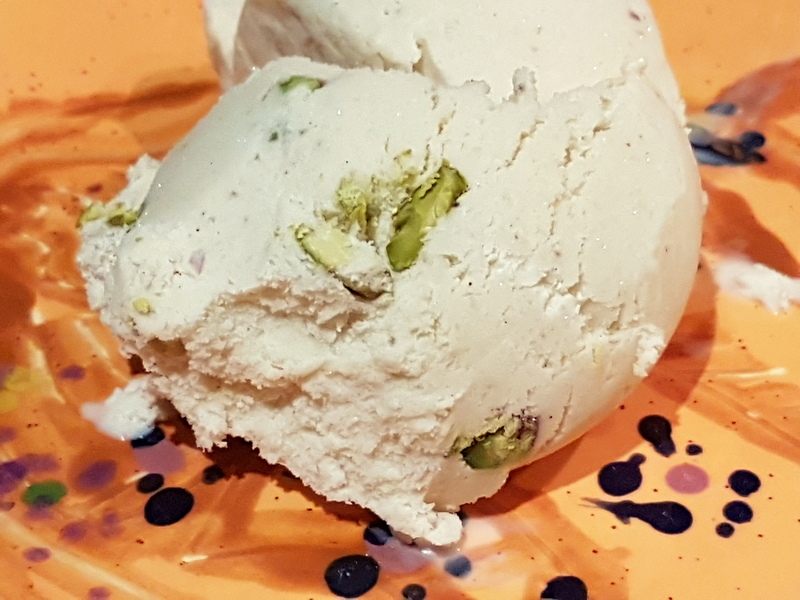 If you prefer, you could of course always cook the mixture and achieve the same end-result, and then wait for the sugar syrup to cool down (For a general post on how to make sorbets, go here!). 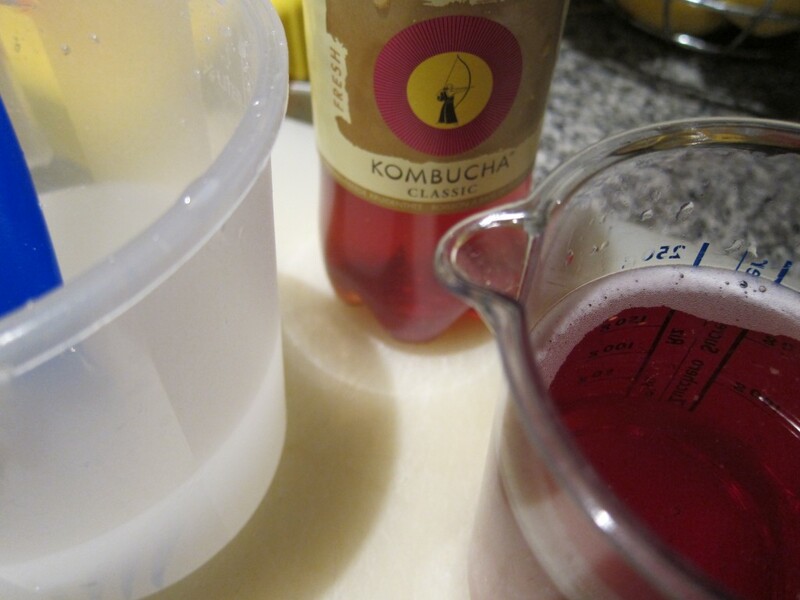 If you feel very strongly about doing everything yourself, Kombucha can be prepared at home. The process appears almost as simple as it is fascinating, with the creation of the “Kombucha mushroom” and all. Go here or here for a couple of helpful sets of illustrative instructions on how to best prepare and ferment your own Kombucha. However, since it will take almost two weeks even with the right ingredients at hand, you may want to follow my example and get hold of some commercial, ready-made Kombucha. The one I used came with a pleasant hint of cherry flavour. Since my sugar syrup was cold already from the start, I now proceeded by blending in the (chilled) Kombucha. The fermented nature of the Kombucha quickly showed in the foaming bubbles you can see in the picture. As could be expected, the sorbet base turned out to be quite sweet. In order to balance the final result without affecting the overall base flavour, I added the juice of 1/2 lemon – a highly recommended move! After having finished admiring the beautiful colour of the sorbet base, I swiftly poured it into the ice cream machine. The reddish waves of churning sorbet base was also quite a sight! Prepare the sugar syrup by mixing together equal parts of sugar and water until the sugar has dissolved completely (possibly by cooking the mixture). 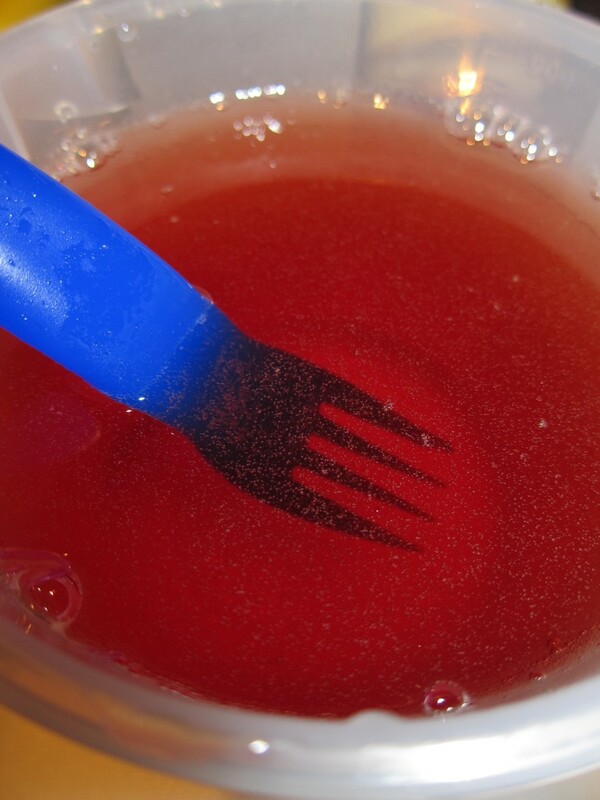 Blend the (cold, preferably even chilled) sugar syrup with cold/chilled Kombucha. Add the juice of ½ lemon. Churn in an ice cream machine according to instructions. Put in freezer container, cover with plastic film and lid. Put in the freezer. 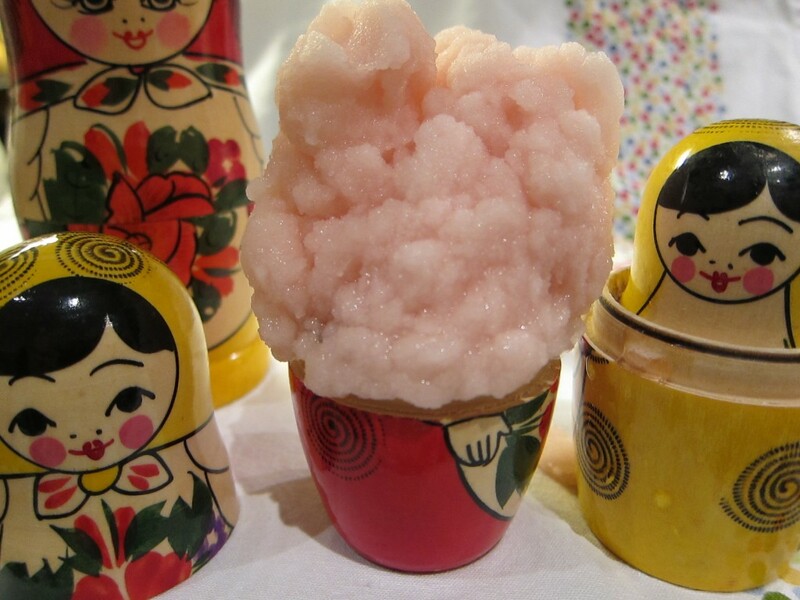 As with most sorbets, be careful not to over-churn the sorbet. 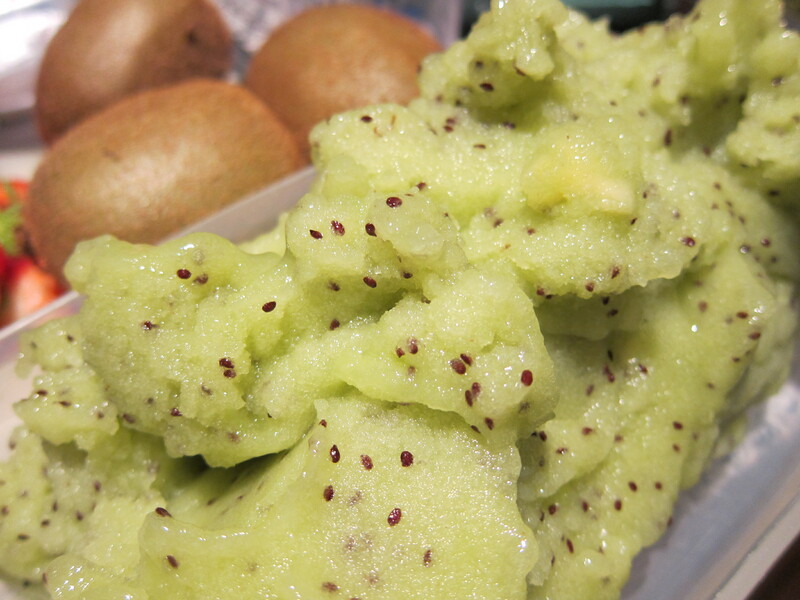 Rather than letting it over-churn, rely on the freezer to put the finishing stabilising touch to the sorbet.